Trees were planted in 1863 to celebrate the wedding of the Prince and Princess of Wales. Memorial tablets commemorating the date of the planting were placed beside the trees in 1932. Both of the trees fell down and were replaced in 2008 and 2013. On 19th May 1863 celebrations were held at Taradale to commemorate the marriage of Prince Albert Edward, Prince of Wales, eldest son of Victoria and Albert and future King Edward VII, to Princess Alexandra, which had taken place on the 10th March. Arches were erected over the High Street Bridge, lights were displayed outside private homes and the general public enjoyed a `sumptuous repast` supplied at the expense of the Municipal Council. Hotels provided free drinks, 250 children received `buns, tea and fruit`, and in the evening there was a grand fireworks display and bonfires on surrounding hills. The focus of the day`s festivities was provided by a procession of the Municipal Council, Magistrates and Oddfellows who marched with the community to the Public Park accompanied by the Vaughan Brass Band. Here they officially planted two English oaks in honour of the Royal pair. Monuments record the events. Two memorial tablets and memorial gates have been unveiled in Taradale in honour of the late King Edward and Queen Alexandra. 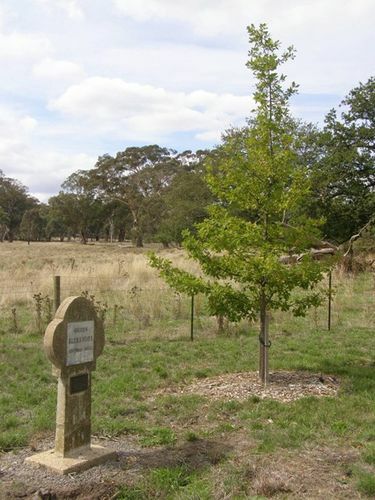 On the occasion of the marriage of the King and Queen in 1863 two English oak trees were planted in Barkly Park, Taradale, and the memorial tablets have been placed beside the trees by the Metcalf Shire Council to perpetuate the history of the trees. About 50 members of the Taradale Old Boys and Girls Association travelled from Melbourne to perform the unveiling ceremony which was performed by the president of the association (Mr.G.Wildman) and secretary (Mr W.White). The Argus (Melbourne), 14th June 1932.